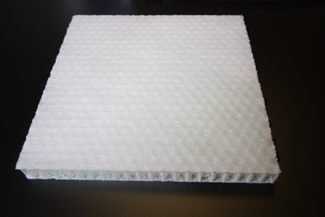 GM Panels are pleased to introduce the latest innovative lightweight honeycomb panel. The new panels are both lightweight and strong. In conjunction with US Environmental Protection Agency and the Office of Transportation and Air Quality, analysis has shown that by reducing 10% of a vehicle weight, reduces fuel consumption between 5-10%. For example, 3000lbs of weight reduction could improve fuel economy up 3% or between 200 and 500 gallons of fuel per year. This also eliminates 2-5 metric tons of greenhouse gas emissions per year.